You can replace the shrimp with cooked crab, lobster, ground pork or chicken. The tangy, apricot dipping sauce comes together in a pinch. In a large skillet, saute ginger and garlic in 1 tablespoon oil over medium heat for 1 minute. Add the shrimp, onions, carrot, red pepper, bean sprouts, water and soy sauce; cook and stir for 2-3 minutes or until vegetables are crisp-tender and shrimp turn pink. Reduce heat to low; cook for 4-5 minutes or until most of the liquid has evaporated. Remove from the heat; let stand for 15 minutes. 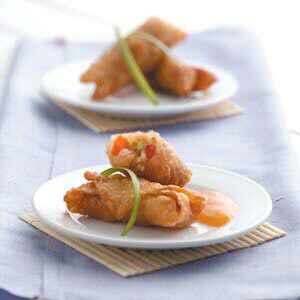 Place a tablespoonful of shrimp mixture in the center of a wonton wrapper. (Keep wrappers covered with a damp paper towel until ready to use.) Fold bottom corner over filling. Fold sides toward center over filling. Moisten remaining corner with water; roll up tightly to seal. In a large skillet over medium heat, cook egg rolls, a few at a time, in remaining oil for 5-7 minutes on each side or until golden brown. Drain on paper towels. In a blender, combine the sauce ingredients; cover and process until smooth. Serve with egg rolls. Yield: 38 egg rolls.